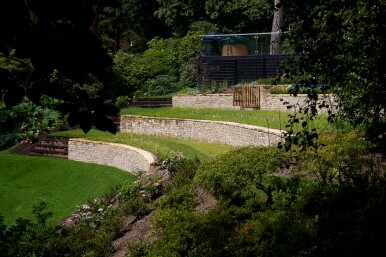 We worked with a notable garden designer for this prestigious garden and Sandstone walls in the Wentworth Estate. Having been successful in the tender for this project our skilled team created these stunning sandstone walls using imported Purbeck stone. The designer had provided detailed drawings and a specification from a structural engineer to ensure that these were constructed to a high standard. We had a specific time window to achieve on the walls in order to sew a wildflower meadow strip immediately in front.